Imani's Creations & Entertainment, Inc is vending at this Harlem One Stop event Sat., June 21th & June 28th, please come by & visit our booth! Come enjoy selections of our Handmade Pyramids, Jewelry, Gemstone Accessories, Culutral Garbs, Empowering literature, Holistic services & MORE! Imani sings at ART HOUSE JAZZ EVENT! Imani is Singing at this Special Event, and you're invited to attend!!! an exciting new concept in presenting Black Culture! Featuring original Sculptures by Harlem Artist SHAKA; Jazzy Funky music by KING KTAKEI and friends; and hosted by Stage Actor LASANA AKACHI! 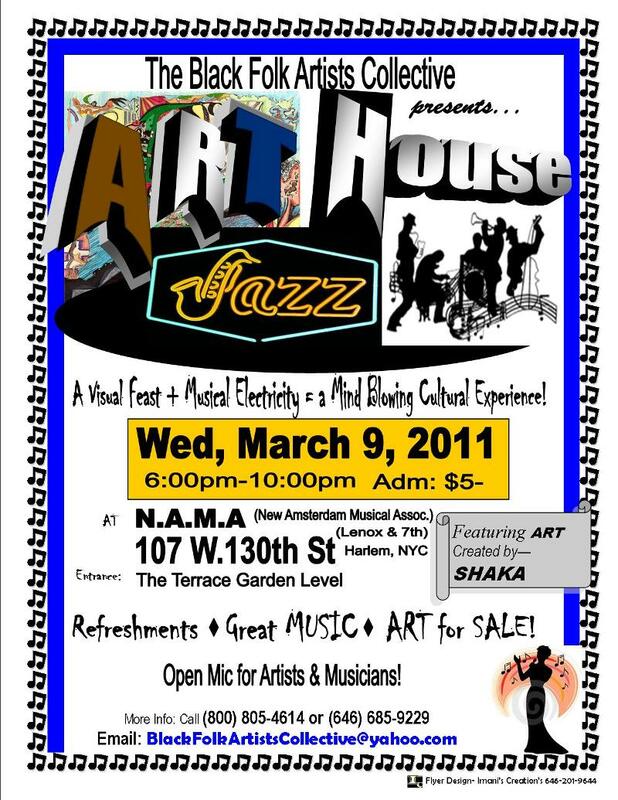 Featuring Amazing Art Sculptures & Painting by SHAKA! Admission is $5 and includes Art exhibit, Music, and Refreshments! 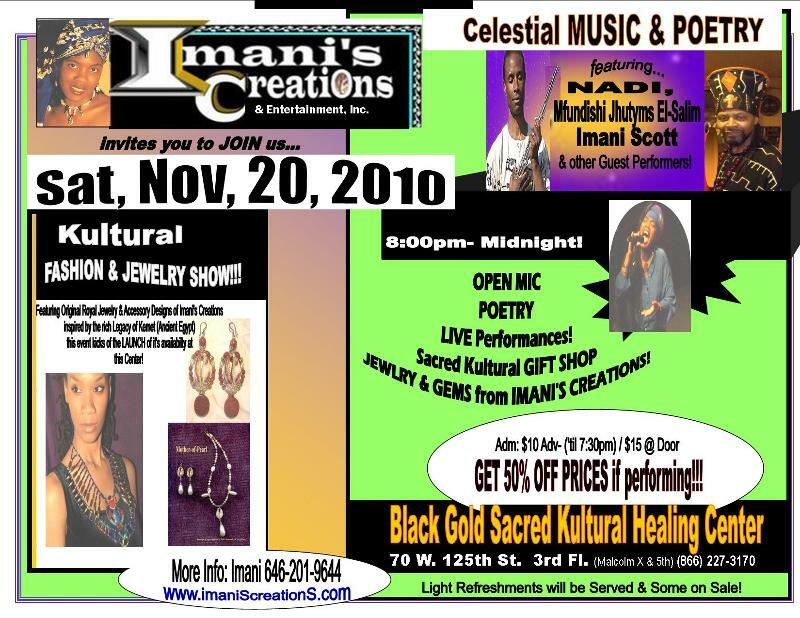 11/20- at BLACK GOLD-a Celestial Journey in MUSIC, POETRY & FASHION w, Mfundishi, Imani & Nadi & others!!! at the Door!- Pay only $15- & $7.50 if performing!!! Night of Music, Poetry & Fashion! that adorns & Heightens your Divinity, Beauty & Power! *$5- adv. up to 7:30pm & $7.50 after 8:00pm! be eligible to WIN a Special Gift! LESTER LOVINGS- SILVER ( 25th) Anniversary! Imani's 1st Crystal & Pyramid (Mer-Khut) Teacher! 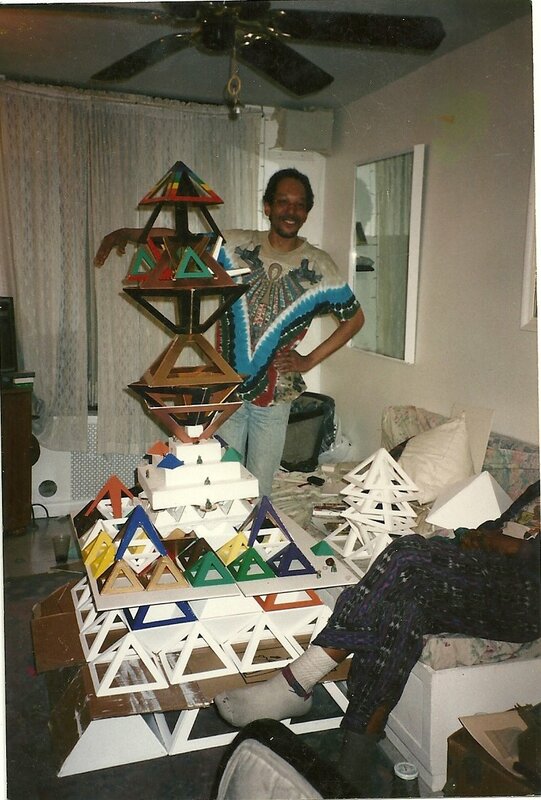 Come by & Celebrate LESTER LOVINGS 25th Anniversary at his exclusive Pyramid Showcase! Hosting the event & Celebrating her 66th Earthday is Hafeesah the founder of the ORIGINAL- "Circle of Sisters"
Did you know the current works of Imani's Creations/C.Truth N-terprize, Inc evolved out of my being in an 2 year aprenticeship working with Lester Loving in Queen's New York! Yes, my being educated by this master metaphysician, brilliant scientist, innovative genius of an artist, began the evolution of my Gemstone/Crystal & Pyramid knowledge spending adventurous daily full-time hours under his tutiledge & craftsmanship, which was my permanent leave from Corporate America!. This experience catapulted my 1st Re-Birth, a sense of purpose, a fortified spirit, mission & vision of as I uncovered unknown levels of creativity (in addition to singing! It birthed my NEW VOICE, STYLINGS & HIGHER Octaves!) re-discovering myself! With additional mentorship by other Cultural scholars & Holistic practitioners, thus the birth on my entreprenuership & a whole New me- IMANI!